ENTERTAINMENT: Tween Stars Live Tour comes to Chicago 7/28 - Exclusive Promo Code | A Savings WOW! We had to admit this, but sometimes when our kids leave the room and they’ve left a tween show on that they’ve been watching, we still keep watching them. We also find them entertaining. So, we’re all excited about the Tween Stars Live Tour that will be coming to Chicago on July 28th at the Rosemont Theatre. Hear cool behind-the-scene secrets, hilarious jokes, and stories. Take part in a super awesome Q&A where you can ask anything you want to get to know what it is really like to be one of the hottest tween stars on TV today! Play stump stars to include prizes, off the wall gooiness and more! PROMO CODE: Purchase your tickets using our promo code mcm for special discounts and promotions. 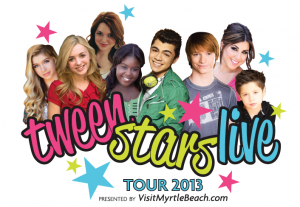 Let us know which tween star your child (or you) are most excited to see at the Tween Stars Live Tour in Chicago! Disclosure: We were provided tickets to attend the show. All opinions are our own honest opinions. Please see our disclosure policy for more information.